If you have driven past any of our schools this past week you might have noticed a new banner. 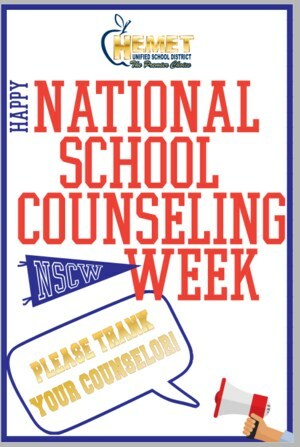 This banner was displayed to encourage our students, staff, and families to join us as we celebrate National School Counseling Week, sponsored by the American School Counselor Association (ASCA). The goal is to highlight the unique contribution of school counselors within the school systems and the impact they have on student success before and after graduation. Hemet Unified School District has 42 counselors and is taking this week to celebrate the impact they have on our students. Students were encouraged to write reasons why they love their counselor, students were given stickers that read, “I love my school counselor” to wear around campus with pride, counselors were given raffle tickets to win various prizes, and more! “Though we dedicated this week to celebrate our school counselors, I hope they know that our appreciation for them is year-round. They are an integral part in all of our schools and we are thankful for all of their hard work,” said Superintendent Christi Barrett. If you have had a positive experience with one of our school counselors and would like to thank them, please reach out to your child’s school for more information!